With the highly anticipated ASUS Transformer Prime release just around the corner, and pre-orders selling out so quick Amazon had to cancel orders, you may be interested in seeing what this little device is all about. 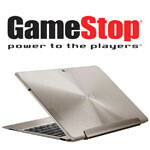 This weekend select GameStop locations will have the ASUS Transformer Prime on hand for you to demo. The event takes place this weekend, however, GameStop has not published a list of locations, so its up to you to contact your local store to find out if they will have a Transformer Prime for you to toy with. The Transformer Prime is set to be the first quad-core Android tablet. It is slated to sport NVIDIA’s Tegra 3 quad-core processor, 1 GB of RAM, and a 10” Super IPS+ display with a 1280x800 resolution, making it a perfect addition to GameStop’s new tablet offerings.